[無料] Arabic Genie | Mac App Storeのアプリ検索・ランキング BuzzMac! Arabic Genie is an Arabic Word Processor, Arabic Text Importer & Arabic Text Converter. It allows you to use right to left Arabic text on almost all applications, which are not supporting Arabic language normally. These applications are including Microsoft Word, Microsoft Excel, Microsoft PowerPoint, Adobe Illustrator, Adobe InDesign, Adobe Photoshop, Adobe Flash, and QuarkXPress etc. 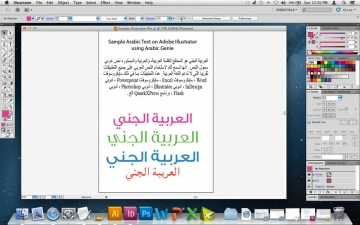 Arabic Genie allows using various Arabic font types including popular Unicode fonts and non Unicode AXT fonts. 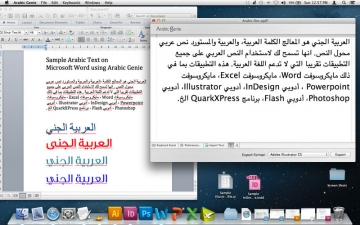 Arabic Genie supports almost all Arabic fonts currently used on Mac & other platforms. Arabic Genie can import and convert Arabic documents to use with almost all non-Arabic applications. ◼ Are there any Arabic fonts included with Arabic Genie? No, You could use standard fonts pre-installed with MacOSX. Or use any free-ware or commercial Unicode fonts available on Internet. Try searching using ‘Arabic Unicode Fonts' as keyword. ◼ is it possible to import an Arabic document from Microsoft Word? 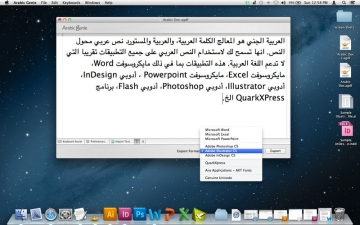 Yes, Arabic Genie can import Microsoft Word document directly into Arabic Genie. After import into Arabic Genie, you could export into any applications using the Export button with specific application Options. ◼ I don't have Arabic Keyboard hardware. What to do? Not a problem, Arabic Genie has a nice in-line Keyboard Assistant. Which allows you to type using the mouse or current keyboard. 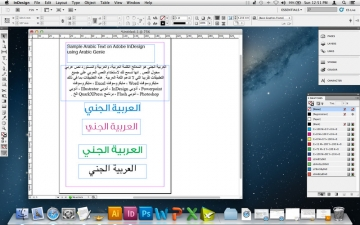 • Works with Standard Unicode Fonts with Arabic characters. • Imports Microsoft Word format & text format Arabic documents. • Allows system keyboard layouts. • Allows mixing of non-Arabic texts with Arabic.